I am still battling the big blue blob. I've knit about halfway through the second sleeve, so it won't be ready for Christmas, but it should be done not long after. I have packed another present in the box and will send the sweater by and by. In the meantime, you get another finished object post! How lucky are you. The Common Reader will remember that I bought a new-to-me spinning wheel. A few weeks later, the lady I purchased it from, Nena, called me up and asked if I would like some fiber she'd found while cleaning. Would I ever! Among this fiber was some angora/alpaca roving that she'd purchased at Estes in 1996 (!!). It was perfectly lovely. 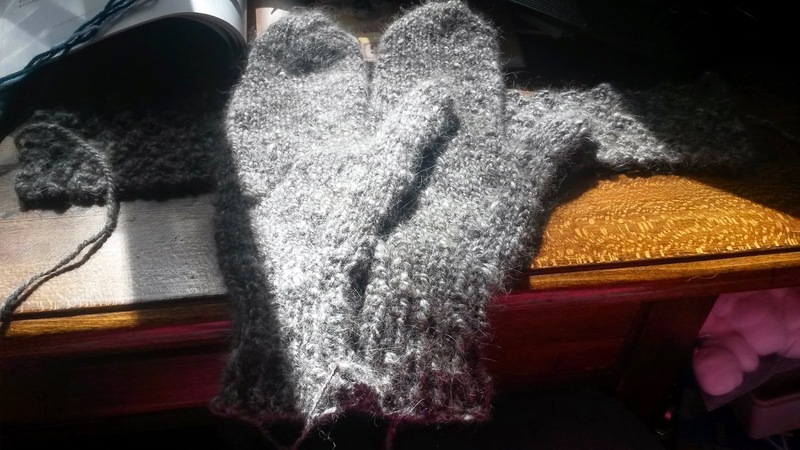 I had promised Malia, one of our wedding attendants, that I would knit her anything she liked--within reason--and she requested mittens. When I saw the alpaca/angora, the wheels in my head and my living room* began turning immediately. Aren't they pretty? I could not resist putting them on myself. And they got to Malia just in time for the snow to start where she lives. A success all around. in my soup, monkeys and rabbits loop-de-loop . . . STUCK IN MY HEAD FOR ALL TIME! 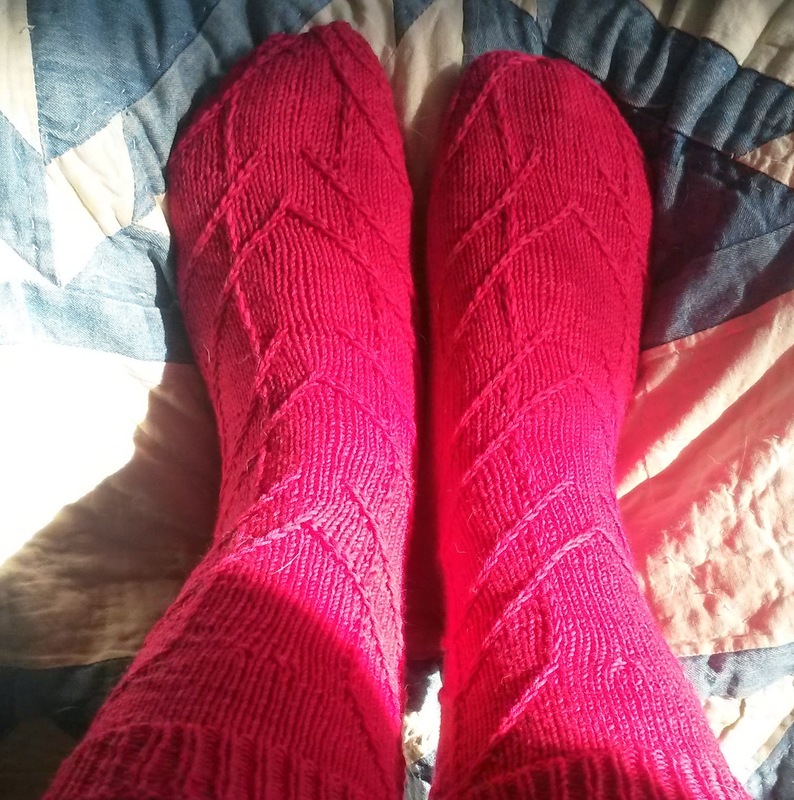 As you may have guessed, I finished the Animal Crackers socks! PATTERN: Animal Crackers by Don Yarman. Interesting and enjoyable to knit. 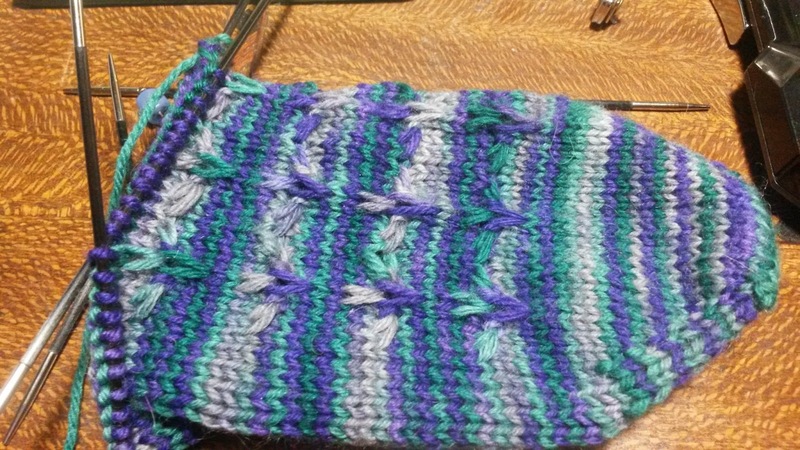 I made the smallest size minus four stitches to account for my gauge in the thickish yarn. YARN: Wollmeise Twin (80/20 merino/nylon, 510 yds/150g skein) in colorway WD Himbeere. A note about Wollmeise colors--Claudia, the dyer, has what you might call exacting color standards, and skeins that don't meet them are pulled out and labeled "We're Different." 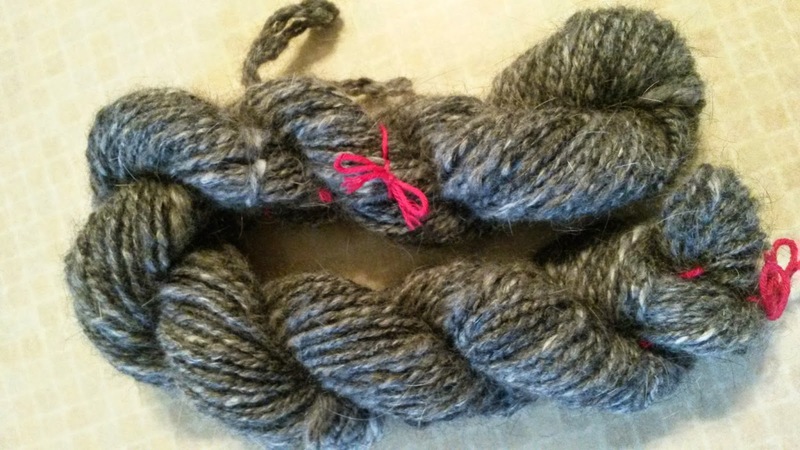 She sells them in grab bags on her website, and sometimes regular skeins are pressed into service. So WD skeins can be very close to a named colorway, or they can be radically different. Either way, they're still lovely. 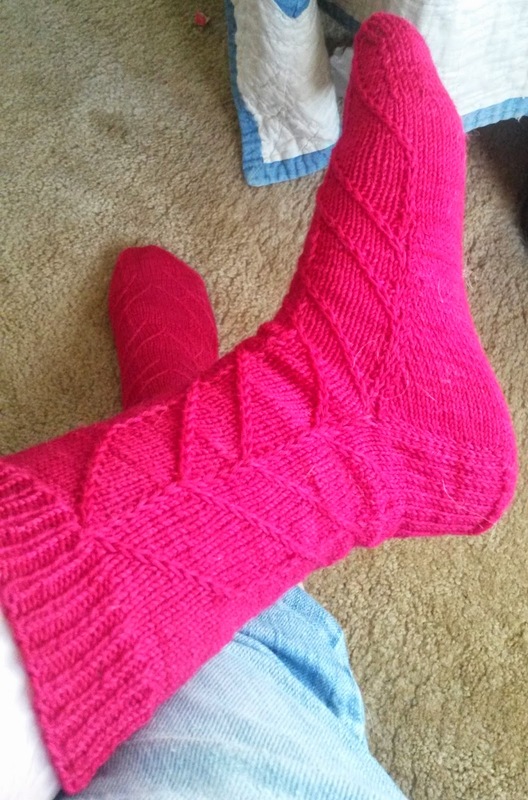 As always, it's a pleasure to knit with WM, and it makes wonderful socks. I used just under 100g. NEEDLES: US 0/2mm. Knitter's Pride Karbonz have lately become my favorites, more so even than wood. I don't like the metal tips, which seem a bit sleazy, but I do like the carbon. I have a pair of knockoff Blackthorns, but I haven't tried them yet. 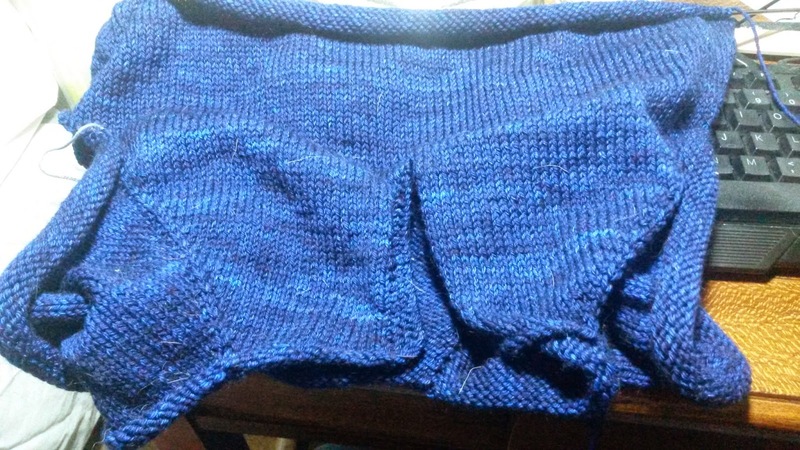 I am still knitting on the big blue blob, incidentally. It has gained a ribbing and about 8 inches of sleeve. Send chocolate. Oh good heavens, I blinked again, and here it is December. "This," you may say, "looks an awful lot like a giant blue blob." Well, you'd be right about that. In theory it will grow up to be a "# 255 Henley neck down pullover for men" (how's that for euphony? ), which is intended as a Christmas present for my little brother. I've been working mostly on that because, as the astute will note, Christmas is only about three weeks away, and the blob is still in blob form. It is several inches longer now than in the photo but not THAT much longer. 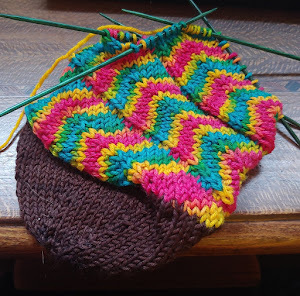 My other project of late, when I can't take anymore of the Blob, is a sock. It is also intended as a gift, but I don't think it will be a Christmas gift. More like a vernal equinox gift. I do have lots and lots of finished objects to show you, but those will have to wait for another day, as I am back to blob knitting. Later, gators!